HTAs (HTML Applications) are webpages (forms), with access to local resources. Though the engine that executes HTAs (MSHTA.EXE) shares a lot of code with Internet Explorer, it doesn't have Internet Explorer's tight security restrictions. In fact, if run with elevated privileges, HTAs have access to every resource that administrators have access to! If you want to build a nice looking user interface for your VBScript scripts collection, try an HTA (or rewrite them in Visual Basic). If you need to build a proof of concept for a new program, consider an HTA. 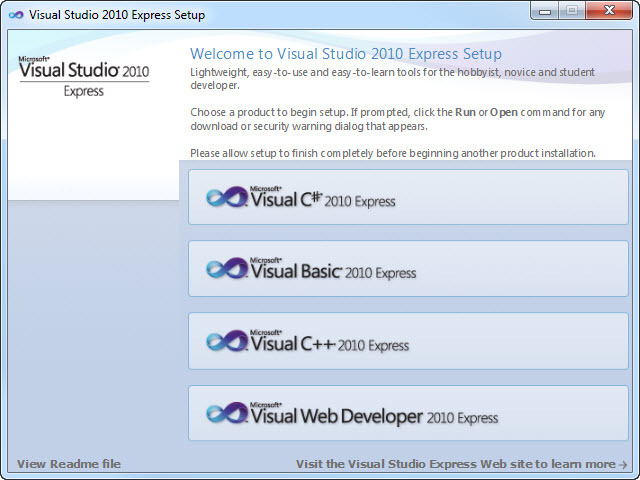 Microsoft's Visual Studio 2010 Express Edition installer is an example of a great looking HTA. On this page, I intend to show some of the pitfalls I encountered in building HTAs, and some solutions or work-arounds. My preferred tools for developing HTAs are VBSEdit and HTAEdit (they come bundled, 32-bit and 64-bit VBSEdit and HTAEdit all in a single package). Both come with built-in debugger, but debugging an HTA is much harder then debugging VBScript code, so I usually write and test VBScript code in VBSEdit, and when ready, use it in an HTA's subroutines. Each HTA is actually an HTML page with one or more HTA specific code blocks. Use this code block to initialize objects and variables, parse the (optional) command line, etc. Use this code block to clean up objects, close files, etc. In an HTA, you can add elements and controls just like you would in a web form. The latter is much easier to debug in HTAEdit. For this demo, we will create an HTA that accepts a number as input, and then checks if it is a prime number. Yes, if you are new to HTAs, the following code might look rather overwhelming. Don't worry, I will explain most of it. And you don't have to retype the code, it can be downloaded here. document.getElementById( "OutputResult" ).innerHTML = "Yes, " & intInput & " is a prime number." document.getElementById( "OutputResult" ).innerHTML = "No, " & intInput & " is not a prime number." document.getElementById( "OutputResult" ).innerHTML = "Enter a number, and click the ""Check"" button to check if it is a prime number." As mentioned earlier, the HTA starts with an HTML like head. Specifying a DocType (line 1) is optional, but it may help getting more predictable results when running the HTA in different Windows versions. Unlike "true" web pages, you don't have to include a <title> tag here, you can set it later, on-the-fly, which is demonstrated in the Window_OnLoad subroutine, on line 61. In the head we also find the mandatory <HTA:APPLICATION> tag (lines 6..10); it is automatically generated by HTAEdit when opening a new project, and can then be edited manually or interactively. Just for the sake of demonstration, I also included an optional stylesheet (lines 12..20). A textbox (line 67, ID InputNumber) to enter the number in; note that HTML 5's type="number" is ignored in HTAs, that is why we call the ValidateInput subroutine using the onchange and onkeyup event handlers. A button (line 69) that will call the CheckIfPrime subroutine when clicked. A text paragraph (line 73, ID OutputResult) that can be modified on-the-fly. Between the head and the body we have a (VBScript) code block (lines 23..63). Option Explicit (line 24) is optional, but you really should include this, if only for debugging purposes. Subroutine CheckIfPrime( ) (lines 26..40) is the main program, checking the number and returning the result. There is no need to check if the input actually is a positive integer, since validation is already handled by the ValidateInput( ) helper subroutine. This will replace the text in the ouput text paragraph (line 73, ID OutputResult). Subroutine ValidateInput( ) (lines 42..57) is a helper subroutine, filtering out everything from the input but numbers. It is triggered when the content of the textbox (line 67, ID InputNumber) is changed (onchange event handler, i.e. on change of typed input, but also when new input is pasted from the clipboard) or when a key is pressed (onkeyup event handler). The code in line 44 reads the input just like the CheckIfPrime( ) does. The subroutine then uses a regular expression to remove everything but numbers (line 49). The code in line 50 writes the corrected input back into the textbox. The code in lines 51 and 54 changes the output text from result to description. Subroutine Sub Window_OnLoad (lines 59..62) is executed when the HTA is loaded. In our demo it resizes the HTA's window (line 60) and sets the HTA's title (line 61). Investigate the demo script, play with it, e.g. change the presentation of the results, or try making it accept hexadecimal numbers, or trigger CheckIfPrime( ) when pressing the Enter key . . . Note: Keep in mind that, when running an HTA in HTAEdit, it runs a copy of the HTA in a different location! Handling command line arguments in HTAs is not as sophisticated as it is in "pure" VBScript, but it is "doable". where MY_HTA_ID is the HTA's ID as defined in the HTA's head. The string returned as command line starts with the HTA's full path, followed by the command line arguments, if any. The HTA's path may be in doublequotes. I could not find documentation on the optional True argument of window.close. But, since HTAEdit only "recognizes" Self.close I would recommend using that. Important: Do not set the WINDOWSTATE in your HTA definition block when using code to resize the HTA's window. Important: Do not set the WINDOWSTATE in your HTA definition block when using this code. When an HTA loads, it won't show its interface untill all work has been done, i.e. untill the code in the Window_OnLoad subroutine, and all other code called from there, has been executed. From the outside, it may look like the HTA loads an empty window "frame" and then waits for several seconds before showing its inteface elements. You can speed up the loading of the interface by only executing the code to build the interface in the Window_OnLoad subroutine, and then start a new thread to initialize the "background" code. This will start subroutine after a 1 second (1000 milliseconds) delay, allowing the HTA enough time to render its interface before continuing. window.setTimeout "MsgBox 'This MsgBox was started in a separate thread', vbOKOnly, 'Test'", 1000, "VBScript"
As you can see from the example, finding typos may be a bit harder than usual. The third argument for window.setTimeout will be "VBScript" in most cases. As one might expect, it is possible to use images in HTAs with the <img src="..." /> tag. Personally I prefer to distribute HTAs as a single file. The good news: it is possible with inline-images. The bad news: your HTA may become huge! First compress your image as much as is acceptable (e.g. JPEG compression, decrease color depth, etc.). And if you aren't convinced yet, check the properties of the demo project screenshot above . . .
Or check the source code of my Attic Numerals Converter. By default, HTAs display webpages in Compatibility View, which displays standards-mode content in IE7 Standards mode and quirks mode content in IE5 (Quirks) mode. Rounded corners, rotated text, HTML 5's new input types, and other HTML 5 and CSS 3 features are ignored in this default mode. This will enable HTML 5 and CSS 3 support in your HTA (though <input type="number" /> still seems to be ignored). You may change content="ie=9" to content="ie=10" if you want, higher is not recommended because it introduces new serious challenges and quirks. Object doesn't support this property or method for HTAID.version: revert to content="ie=9"
Warning: The current version of HTAEdit may sometimes revert your case changes while editing (e.g. Self), so stay alert! Note, however, that you now need to adjust all event handlers! Testing your HTAs in HTAEdit is great, much faster than having to switch from the editor to a command line or Windows Explorer and vice versa. Keep in mind, though, that when you click the "Run" button (or hit F5), HTAEdit will open and run a copy of the HTA in a different location! Though the order of your HTA's subroutines is not critical to run it, HTAEdit's debugger treats them rather "linearly", e.g. if a global variable/object is set in line 100 in the Window_OnLoad subroutine, and referred to in another subroutine in line 50, HTAEdit's debugger will consider the variable/object not set. So, for debugging purposes, you may want to change the order of the subroutines, as explained in the next paragraph. Compatibility mode is great if you want to use rounded corners, rotated text and many other CSS 3 features, but it may make debugging a challenge in HTAEdit. Compare the error messages when clicking the "Test" button in the following demo HTA, for quirks mode and for compatibility mode. 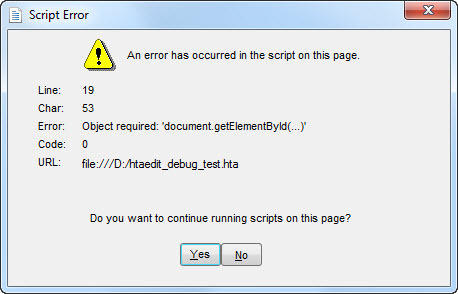 document.getElementById( "DoesNotExist" ).value = "Error"
The error message points out the exact line where the error occurred. Now the error message points to the line calling the subroutine that contains the error! The work-around for this limitation is to temporarily disable compatibility mode until all VBScript code has been debugged. Editors like HTAEdit make debugging HTAs easier, but not quite as easy as "normal" VBScript code. All advices for debugging VBScript are valid for debugging HTAs too. When using global variables in HTAs, declare them at the top of the code block, set them in the window_onload subroutine, and clear objects in the window_onunload subroutine. Place the window_onload subroutine just below the global declarations, the window_onunload subroutine at the end of the code block, and all other subroutines in between. Why? 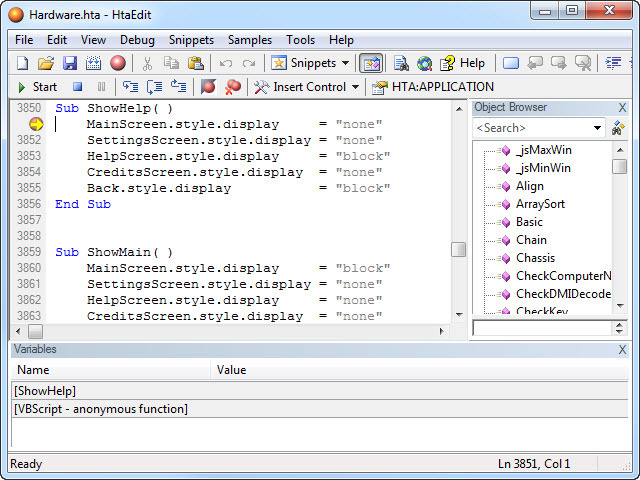 Because HTAEdit's built-in debugger doesn't recognize objects in code lines after the one where they are cleared, i.e. Set object = Nothing. Though multithreading is quite easy in HTAs, debugging a separate thread is impossible in HTAEdit's debugger. So you'd better postpone using multithreading untill all debugging has been done. Global variables will not be shown in HTAEdit's debugger window when hitting a breakpoint in a subroutine. It may be useful to declare a dummy variable in the subroutine you are debugging, and then set its value to that of the global variable just before the breakpoint. More, even, then "normal" VBScript code, HTA code can have some stray code left after making changes: undeclared new variables, unused variables, or even entire unused subroutines. This will increase maintenance complexity of your HTA. Using an editor like HTAEdit you will get warnings when trying to use undeclared variables, including typos in variable names (assuming Option Explicit is your first line of code in the VBScript block, which is highly recommended). Use my CheckVarsVBS.exe to check for unused variables and subroutines. Try Adersoft's HtaEdit, an HTA editor with built-in debugger, IntelliSense™ like "intelligence", COM object browser, snippets library, configurable external tools and built-in packager (HTA "compiler").